Paste Don’t Plate! People are doing 90 layer multilayers with paste interconnects. Want to learn more? 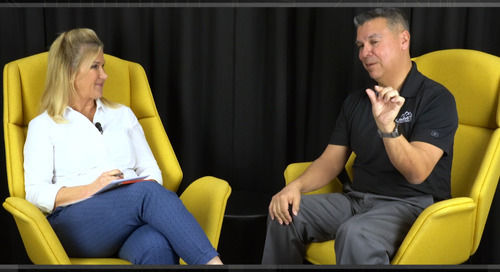 Find out about paste sintering from Chris Hunrath to learn more about its applications and benefits to PCB designers. What must designers consider and what are the advantages of Ormet’s products? 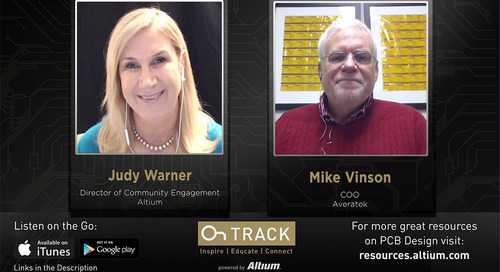 Listen in for insights from the expert in this week’s episode. Design considerations: Where to split up layers for best design benefit; Via at 1:1 or less aspect ratio - only in 1 B stage layer and correct size via for applying paste; Size of receptor pad for laser drill via must be correct to prevent paste from running - spread glass is good for B-stage; annular ring around the via to register laser drilling; with many paste interconnects - don't paste to the edge. People are doing 90 layer multilayers with paste interconnects. Hi everyone. 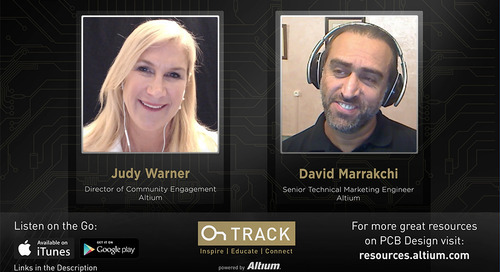 This is Judy Warner with Altium's OnTrack Podcast. Welcome back, here we are again with your friend and mine, Chris Hunrath from Insulectro who's going to teach us about paste sintering today, which I don't know much about, but we're going to learn about it together. 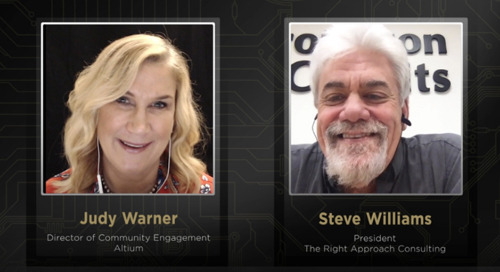 But before we get started, remember to hit all the typical Altium social media platforms Facebook, LinkedIn, and Twitter please follow me on LinkedIn and also remember we are recording on YouTube as well as Podbean and we can be found on all your favorite podcast apps. Alright, so today we're going to talk about - I don't even know how to set this up entirely cause I'm just as much as a student. So Chris, welcome back! Thank you again, and I know this isn't a new technology - it's just not one that has crossed my path. So tell us about what paste sintering is and what the applications are, and benefits to our designers that are listening today? Okay, interconnect technology, as you mentioned is not new, what's happened recently though is there's been some new material developments that make it more feasible for the circuit boards. Certainly in ceramic fire technology, metal - powdered metals have been used to make interconnects and traces and circuits on ceramic circuit boards, but those fire at 850-plus degrees Celsius, which would obviously destroy most PCB materials so there's some new technologies out now. There are different kinds of pastes that are used for interconnects. The one that we work with, and the one that we promote, is something from a company called Ormet, and their material is interesting because it sinters at one temperature and then it forms a new alloy with a higher melting point. Okay I feel like we need to back up and explain what paste interconnect technology actually is. Like how it's performed and then we can go into the material science part just so I can keep up, Chris I want to be able to keep up. So multi-layer PCBs - also not new - typically what you do is, you print and edge any number of layers, you drill and then you plate. Typically electroless copper, to make the non-conductive surfaces conductive, and then you build up the thickness with electrolytic copper. And some people call it a semi-edited process, because you are using the electroless first as a seed layer. There are some other technologies used to make that dielectric surface conductive, and then you build up with electrolytic copper and so that's how you link the layers of the z-axis. So if you think of a classically - as a circuit board - as a web of foils printed and etched, all your XY connections, and then the drilled holes - whether they're laser drilled, blind vias, or drilled through holes, the plating links everything in the z-axis. Now one of the challenges when you do that, is you're consuming real estate at all the layers. So let's say you have a 12 layer multi-layer - relatively simple multi-layer by today's standards - but you need to connect layer 1 to layer 10 you've taken up the real estate in all the other layers - you can't route circuits in those places, because there's a via in the way, unless you wanted them to connect to that via and they're part of that net. So there's a term called any layer HDI - I don't know if you're familiar with that term? Basically it means you could put a via anywhere you want in any layer. Nowadays that's done typically by what we call build up technology. So you start with a core of some sort - again it could be double sided, it could be a multi-layer core, and then you sequentially build layers and you only go one layer deep with a laser drill sometimes two - depending on the design - but that's not true for any layer. Anyway, you go one layer deep you plate, you print and etch, and you do it again and again and that allows you to put vias almost anywhere you want in any layer, the downside is, it's almost like building multiple circuit boards. So the cost really starts to increase. And of course you're putting the board through multiple lamination cycles and that has some undesirable material side effects depending on the material. Some materials can withstand three lamination cycles, some six, some ten, but it is hard on the materials to go through that lamination process, over and over again. Especially electric phenolics, which are very common for lead-free assembly, because they're relatively economic and they're also - they also will survive lead pre-assembly, but they tend to get more brittle every time they see a thermal cycle though, so that causes some issues too. So what paste interconnects allow you to do, is change the sequence in which the vias are formed. So instead of laminating drilling and plating you can actually drill, add the paste, and then laminate, so it changes the build sequence and this is important both for the fabricator and the designer to understand what that means. So typically what you would do is, you would take a B stage layer of some sort; you can either drill it and paste, fill it with what we call a postage stamp process or you could pre-tack it, vacuum tack it at low temperature to a core of some sort, or substrate, laser drill through the B stage, apply the paste and then when you laminate the paste interconnects, the layers in the z-axis - you could literally take a piece of prepreg, laser drill it with a stencil or with a Mylar Stencil, I'll talk about how that works in a little bit - apply the paste, remove the Mylar laminate between two copper foils, and now you've got interconnects inside a double-sided cork. So then if you print and etch that, now you've got a core with connections between the layers with no visible vias; they're all internal. Yeah there's some technology around the paste and again we can talk about that, in a little bit. So how is it applied - is it squeegeed in? Okay, just like with a silkscreen? Well no screen - so what typically what you do is, you apply a 1 mm Mylar mask to the B stage and you tack it simultaneously. Then when you drill through the Mylar and the prepreg B stage to get down to your copper features, then you apply the paste, and the Mylar's your mask, and then you remove that just prior to lamination. And that stays inside the hole? It doesn't just I don't know the consistency of it. My mind was - pictured it just wanting to drop out of that hole - but it must have some kind of stability? Yeah it's a liquid and there is a tack right. There are a number of ways to do this, but the most common method is to laser drill, apply the paste, dry the paste... you would do it a second time to top it off and then when you remove the Mylar, the liquid paste stays on top of the paste that's already been applied. Then you dry it again, then you go to laminate. Does it air dry or do you have to cure it what do you do? You don't really cure it because it's metal powder - metal powder based - so there isn't really a polymer matrix. Unlike print electronic sinks - which is a again another story - you would just dry off any of the carrier solvent used for the application process. It is a liquid - well it's a paste, not a liquid - but but when you dry off the the solvent that's in it; which is less than 10 percent by weight, then it's just powdered metal and that's how it makes a connection. So think about this right, you've seen a lot of PCB designs - imagine a 32 layer board, which most shops can do, but it's not at the low end of technology. Imagine splitting it up to two 16 layer multi layers right? A lot easier to build and then you just paste them together at the end, and depending on the design, you can electrically test each half and only use the good ones. So your risk is light. There's a lot of advantages to this. Or what if you want to put together three 16 layer multi layers, or four, or 18 or four 18 layer multi layers - it's been done you know. Now a shop; instead of trying to build a 72 layer multilayer - if they're building 18 layer components - it's a lot more manageable. Hmm, that totally makes sense. So you explained some of the benefits - it's a nightmare, and you've seen, we've all seen these cross-sections of these crazy stackups with all the sequential LAM and drilling cycles and all of that. And then - and also kind of an unintended consequence you can get, is you can - from a performance standpoint - if you do enough of that right can't you get excess copper on the surface features? Yes - that's a very good point. So in other words, if you're going through many plating cycles depending on how you break that up and you're trying to meet a wrap requirement, that could definitely add up and make it - make fine line etching more difficult there's a lot of - there are some some drawbacks to traditional processing and then with with an Ormet style process, or a paste interconnect style process, you can eliminate some of those things even with an RF design. Let's say you have very sensitive surface features and you don't want to play with that layer. You might want to put on the surface finish, the nickel gold, but you don't want to put any additional copper - you want just the original foil copper. You could do that with this paste because you could create that as, almost like a double sided board, and then bond it to the rest of the stack up at the very end, and you're done. Interesting. So I think you mentioned too, there's some good signal integrity benefits, did we cover that I don't recall? No, so one of the things that a lot of designs call for is something called back drill. So you're familiar with that, so you do the back drilling to get rid of the unwanted copper. So again, in my earlier example let's say you're connecting layer 1 and 10, and let's just say it's a 22 layer - 26 layer multi-layer. You're going to have a lot of extra copper metal in that via that you really don't need or want. So common technology is to back drill down to layer 10. Now of course drilling to that precise location or depth, to remove the copper up to layer 10, but not beyond. It can cause a reliability concern that's a bit of a challenge. So there's those issues. What you can do with the paste technology is let's just separate that board at layer 10, and not put a via on that half that goes from layer 11 to whatever the other layer is and you're done. So you can eliminate back drilling and the parasitic effects of having that extra copper and the via so that's another application. So there's some signal integrity benefits, there are some RF applications, there are some high layer cap, multi-layer applications, but also many layer HDI applications; it really depends on how you design it and use the paste. So if you're a designer what kind of design considerations do you need to make up front? Okay, my recommendation would be is: think about the design, think where it would make sense to split up the layers and provide the most design benefit. Generally speaking, we like the via to have a one-to-one or less, aspect ratio. Now that might sound restrictive, but it's only in that one B stage layer. So then that's an important consideration. So in other words, if I have 5 mm of B stage, I won't want my via to be 5 mm or larger where I'm going to apply the paste. It has to do more with the paste physics and how it fills the via and then of course the pad, the receptor pad that you're putting the laser drill via on, needs to be a sufficient size for where the paste doesn't have the opportunity to run on one side or the other of the pad. So we do like an annular ring around the via, that's going to have a lot to do with how well you can register your laser drilling, usually that's pretty good. The other consideration is, the B stage you use, spread glasses - bringing up spread glass again. Spread glass is good, because it tends to keep the paste corralled, whereas if you have an open weave and that prepreg resin's melting and flowing and during the lamination cycle the paste could run to that area. So spread glass is better. Higher viscosity resins tend to be better. We like low flow prepregs. So those are some of the design considerations. Another design consideration is - and I've seen this happen before - where if you have a ground area and you're making a lot of paste interconnects along a wide track. 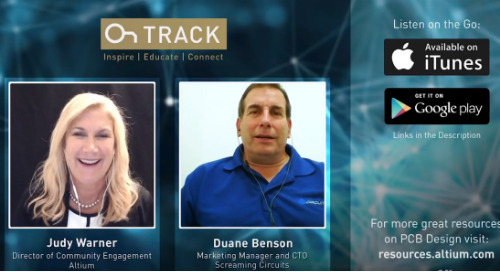 You don't want to put the paste interconnect to the edge of the track because what ends up happening is, during lamination, the resin wants to flow off the surface of the track down the sides to fill - hydraulic effect, and it's going to move the paste with it. I've seen vias actually move during lamination. So just some common-sense things. Keeping in mind that it's the B stage where your interconnect is. You want to make sure you put that in some good locations, and in that particular case all they had to do is, go back and shift the vias a little bit to one side and then everything was fine. So it's just those kinds of things. Certainly they could contact us, we can give them some design hints and I can give you some literature to go along with this video or podcast. Yeah, yeah, very good. Ormet and the paste interconnect - paste sintering - has been around for a little while. What's been the sort of acceptance of it industry-wide? Is it being widely accepted, is it just on certain applications? It's been around a long time. It was primarily used for quick-turn mic review work, and also large format boards where you're literally stitching very large boards together so you can - again the idea is you can make boards that are nearly finished and then electrically interconnect them. The nice thing about the Ormet paste is it doesn't melt at reflow assembly. Hmm, so it changes chemically right, so once the sintering is done then it doesn't change, then it doesn't morph and heat? What attracted us to this technology over some other paste interconnects - because there's other processes where you would apply a paste of some sort and then make a connection with pressure in the z-axis - but what interested us in the Ormet material is: the paste melts at one temperature and alloys - so the paste is basically copper particles with a tin alloy powder. When the tin alloy powder melts - and the melting starts at about 130° Celsius, it starts reacting with the copper and forms an alloy with the copper instead. What's interesting about the Ormet material is, it's alloying with the inner layer coppers as well, on the PCB layers. So we have a metallurgical joint, not just a pressure or contact connection. So it's - and unlike, the tin lead or lead-free alloys and solder, the melt - the new melting point, when it forms an alloy with copper is one phase is 415°, the other is 630° Celsius. So it's not going to remelt that assembly. So it's a permanent connection, so really the paste applications from other technologies like flip chip and whatnot packages where you didn't want to have a secondary or - if you have a secondary reflow operation - you didn't want to have any more remelt. It has some applications there. Or a down hole assembly is another application where the board might be subjected to the temperatures near the solder melting point is another good application for this material. So that's what interests us because you know when a board's in use, it heats up the z-axis expansion with other types of pastes interconnects, you have a resistance change every time the board is heated even from, let's say 40, 50, 60° Celsius in normal use, not even in any kind of environment - parts of the board would heat up from the components and you'd have a change in resistance, and that's what this is designed to circumvent because it forms that metallurgical bond with the copper inner layers. So yeah it's a different technology than the paste you would use in printed electronics. Okay well that's been fascinating. Again I feel like a newcomer to old technology but - and I've known about Ormet that I think got acquired by Merck now, but I've just never had someone sit down and explain it to me. So thank you for doing that. Yes, 90 layer multi layers with paste interconnects yeah. That's crazy, I didn't even know a 90 layer board existed I guess. Yeah I've only really seen them into the 60s I guess personally, so. Yeah you know, one common design was a 72 layer multi-layer, again made out of eighteen layer components, and one of the things with the chip tests the ATE companies, they built some high layer count multi layers and you need a lot of IOs, there's a trend to go to wafer level testing were you’re testing the entire wafer. You need lots of interconnects and that's one way to get there, is to use the Ormet paste to put in lots of layers. So we're seeing more interest in it lately, and I think that's one of the reasons why the technology hasn't taken off until now, is because there just wasn't the demand. Well, I know you've shared with me some cross-sections or I think you did, and so please be sure to share those with us and we'll put those up on our website and we can share your website and Ormet or Mark's website, so the designers can get more information. Is there any place else besides your two websites that you would recommend for more information? You know I've mentioned HDPUG (High Density Packaging Users Group) in the past - they're actually contracting some PCB manufacturers to make some HDI test vehicles with paste interconnects. So there's going to be some data - anybody who's an HDPUG member will have some access to some really good reliability data and they're pretty complex boards so it'll really push the technology but for breaking up big thick and ugly PCBs, that's pretty well-established. Yeah very cool. Okay well thank you. So tell us about that fish on the wall behind you? So it was a gift from my sister, actually it's made from recycled materials so there's an old PCB cut up on there, and the old spark plug wire, and a few other odds and ends. Some artists put together actually I didn't buy it; my sister bought it on Catalina Island and somehow we went out there as a family trip and somehow she smuggled it off the island and gave it to me just before she headed back to Virginia. So it was kind of cool. Oh that's fun a good throwback to your diver self. Yeah so - just the last thing on Ormet, is 'paste don't plate'. Is that their tagline or is that yours? Actually that's their tagline. We were sharing it with the IPC shows, but another nice benefit to the Ormet - which I didn't mention earlier is - there's no electrolysis, no plating processes in these interconnect layers so it circumvents all that. Yeah but if you're capacity constrained, no plating, that's another benefit. Well thanks again this has been really good. If you have anything else juicy to share with the listeners just email it over before we get this one up. And thanks again for this one. Now I know we've talked about exploring down the road a little bit on copper foil, integrity issues, and also printed electronics. So I'm sure I'll hit you up again soon Chris. Yeah definitely. I would like to talk about some of the material science behind printed electronics and I know you guys are working on some new design tools and print electronics; there are a lot of different ways to use that in electronics... I should back up, but there's a lot of different ways to use conductive inks in electronics there are so many different versions of the inks. Which is another subject I know nothing about so it'll be good. I'll be a student with our listeners and, I know they're out there, I know what conductive inks are, but as far as all the applications, all the different materials available, that just seems like something that's in writing a lot, that people are really turning towards a solution. Lots of new technologies are coming out in that space and it's going to be fun to watch it all. Yeah yeah it will be. Okay Chris, thanks for another good podcast and we'll see you soon. My pleasure. 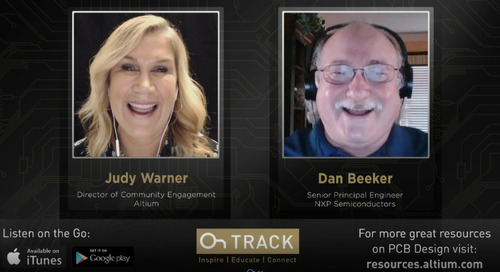 Again this has been Judy Warner with the OnTrack Podcast and Chris Hunrath from Insulectro, we'll see you next time - until then - always stay OnTrack. 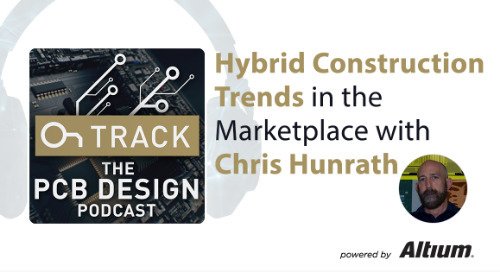 Click to listen to Chris Hunrath’s other episodes about Spread Glass or Material Sets. We’d like to know what questions you have about material sets, so leave a question or feedback in the comments below. Remember the Wild-West of Early Home Computer Design? Do you know what to look for in a new Printed Circuit Board Supplier? 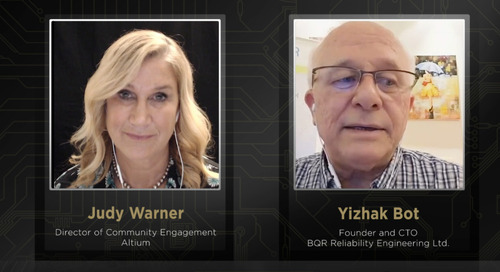 Eliminate failures with Design for Reliability tips from expert Yizhak Bot. 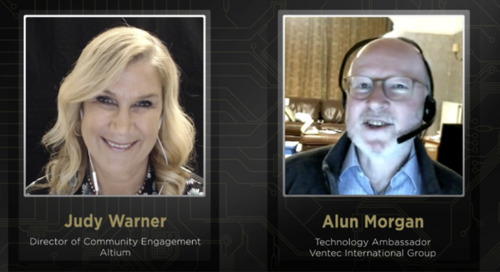 Meet Alun, a Material Scientist at the helm of Ventec. 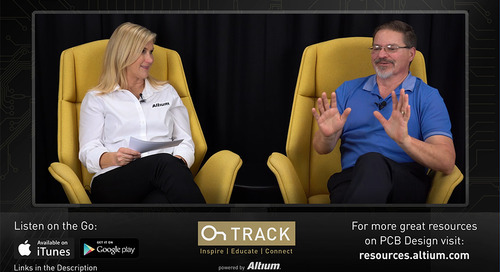 Learn about IPC 4761 and why you should protect vias. Bolt offers a unique model to help startups get off the ground, and get product to market. Stay Ahead of the Electronics Component Shortage, learn about the shortages and what to do about it. 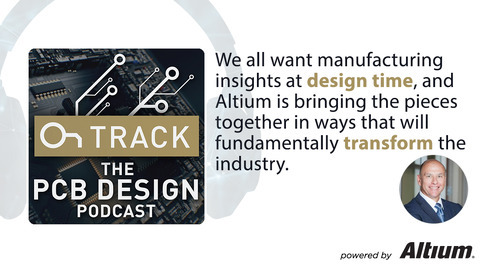 David is an inside expert on Altium Designer, listen for highlights about the latest version of Altium Designer. Listen in and get great tips about where to find training and how to push yourself to keep learning. 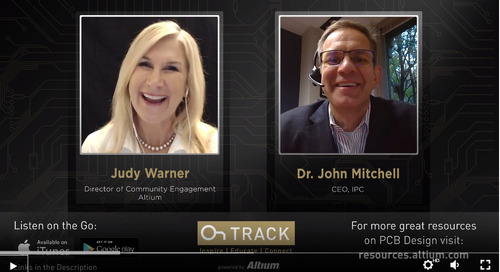 IPC advocating for the industry workforce in Washington D.C. Listen and find out how Mary and Project Vive are using low cost sensors and changing lives by leading the development of innovative medical devices and technology. Spreadsheets and multiple file formats, oh my! Get pro advise on sending clear documentation packages to fab and assembly. 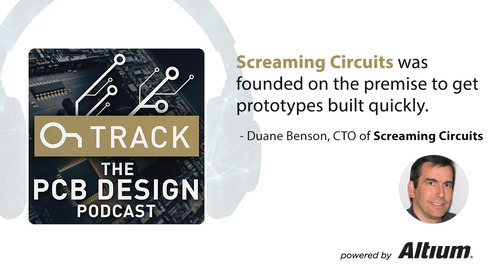 Curious about the future of electronics design? 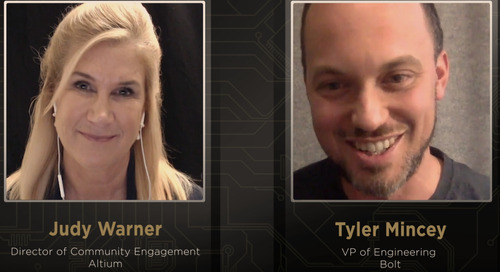 Learn how to migrate from prototype to production while optimizing global processes. Get expert tips on PC Board Stack-up Best Practices with SI guru Rick Hartley. 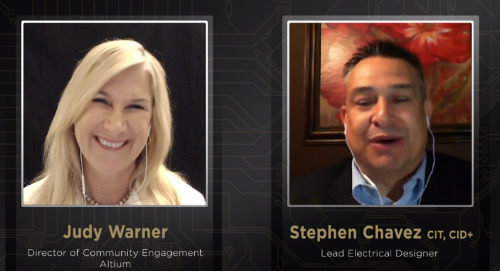 Hybrid construction is a huge growth area with a lot of opportunity for PCB designers. 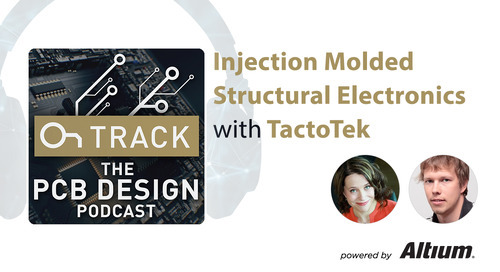 What is Injection Molded Structural Electronics? 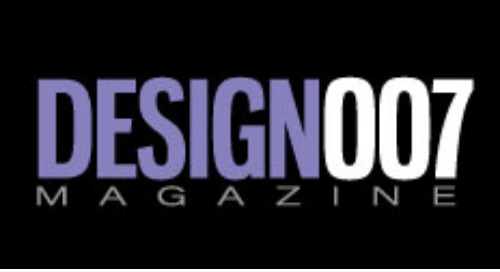 Learn all about the PCB Design Resource designers love, Design007, from iConnect007. 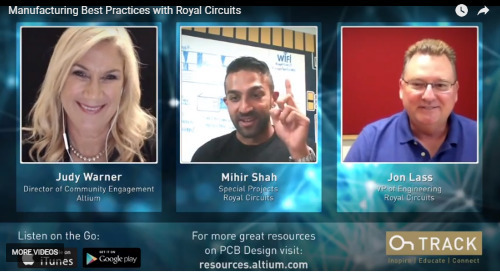 Learn how same-day turn times on printed circuit boards is possible at high quality board shops like Royal Circuits.